Editor’s note: Underground and technical rescue is a highly specialized field within the first responder disciplines. At the Ready is providing resources for free awareness courses for first responders online. The courses are not intended to and do not purport to train or replace training for any responder at any level of technical rescue certification. The Virginia Task Force for Urban Search and Rescue 2 has a series of free courses online, Including Structural Collapse Awareness, Trench Rescue Awareness, Confined Space Awareness, and Critical Incident Stress Awareness. The Massachusetts Fire Chiefs Association and the Massachusetts Department of Fire Services offer a free online course, Awareness of Technical Rescue. This PowerPoint presentation includes the laws and regulations (Osha, NFPA, etc.) governing technical rescue training and operations. The slides cover the topics of rope rescue, confined space rescue, and trench rescue, and are online, and free to view. 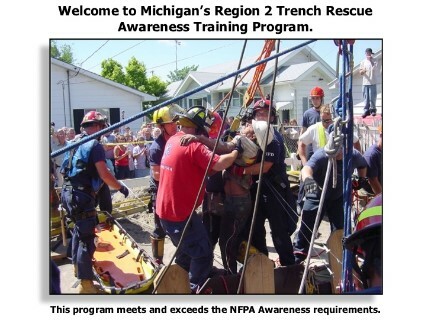 The Michigan Region 2 offer a free Trench Rescue Awareness Course. Released in 2011, this course is online and free to everyone. The Photo to the right was taken from the Introduction slide. In 2011, This Michigan course reported that it exceeded NFPA Requirements.